A new research study, led by scientists at the Children’s Hospital of Philadelphia (CHOP), has uncovered a gene region that raises the risk a child will have a middle ear infection, known clinically as acute otitis media (AOM). 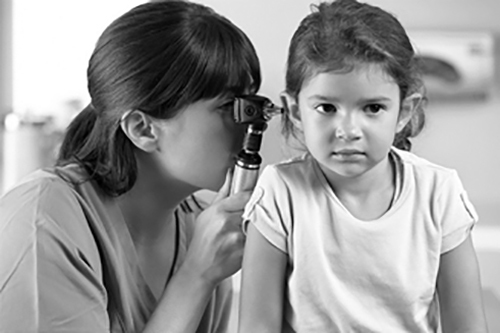 The new findings, published recently in Nature Communications through an article entitled “Genome-wide association study for acute otitis media in children identifies FNDC1 as disease contributing gene,” may help researchers develop more effective treatments to prevent one of the most common childhood illnesses. The research team performed a genome-wide association study (GWAS) on two discovery cohorts with DNA samples from 11,000 children. “We identified a genome-wide significance at a locus on 6q25.3, and show that the associated variants are correlated with the methylation status of the FNDC1 gene, and further show it is an expression quantitative trait loci (eQTL) for FNDC1,” the authors wrote. The CHOP team found an association between AOM and a site on chromosome 6 containing the gene FNDC1 and then replicated the finding in an independent pediatric cohort with data from 2,000 children. Moreover, the investigators observed that the homologous mouse gene corresponding to FNDC1 was expressed in the animal's middle ear. “Although the gene's function in humans has not been well studied, we do know that FNDC1 codes for a protein with a role in inflammation,” noted Dr. Hakonarson. Understanding more about the biological interactions between genes and pathogens involved in AOM, the researchers hope to develop more accurate therapies for the childhood infection, while learning which children are most susceptible to the disease. “As with many other diseases, early medical intervention may offer the greatest benefits,” Dr. Hakonarson concluded.